Acrylic paints on a grey cardboard. I have a box of acrylic paints on my shelf which I used to make miniature clay food with. I haven't been able to take the time to create miniatures anymore after I got into vet school, as I don't have generous blocks of free time anymore. I usually work 1-2 full days on miniatures continually each session, a luxury that became much harder to come by nowadays. As you know, acrylic paints tend to dry over time, I decided to use the ones that are still not caked up for painting. 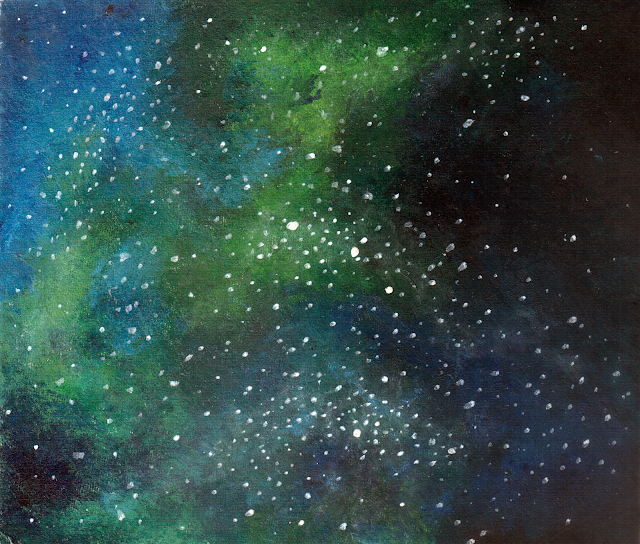 I came across a tutorial on how to create nebula patterns, it was a great short break that I can take between study to be creative and started smudging paint onto the cardboard I can see on my desk. I find there are much to improve my techniques; specifically, I can't create the depths and sense of dimensions it should have between the nebula clouds (some more dark paint between the colors?) and the stars I drew on top looked more like splatters than glowing celestial bodies. I would like to do another similar exercise soon, perhaps with some sponge to add textures and a smaller paint brush/metal ball-tipped tool to recreate stars. I am by no means good at painting, but the process was calmingly therapeutic, which fits nicely as an activity for a break from brain work.